Punxsutawney Phil, the country’s most famous groundhog, didn’t see his shadow this year. So I guess we can go ahead and box up those winter coats and grab our favorite sandals, right? Well, not so much. No offense to the furry Nostradamus but rarely does Phil accurately predict the coming of the season. That doesn’t mean we shouldn’t start thinking about transitioning our bedding to something more spring oriented, because regardless of whether Phil is right or wrong, spring will be here soon enough. Whether you live in a colder climate or it’s 65 year-round, changing up bedding offers a wide spectrum of benefits that can help you start off the season in the right way–and every day after. Switching to lighter, more breathable fabrics, soft blankets instead of heavy comforters or just the simple act of using the right colors, tones and patterns can instantly transform your winter sanctuary into a springtime retreat. At Schweitzer Linen, turning over from season to season is virtually effortless and incredibly affordable. Choose from a wide variety of luxurious fabrics, made for almost fifty years using the same exquisite craftsmanship. Then find the colors and style that helps you achieve the very best you. With hundreds of original designs inspired by places from all over finding a decor that makes you feel more rested, more confident and happier is easier than ever. Here are some easy ways to refresh bedding for the new season and start improving your everyday life. When temperatures start to rise and those soft breezes begin to blow in, you want to make sure you are maximizing your comfort level with lighter sheets that won’t turn your bed into a springtime sauna. If you’ve been using flannel sheets, those should be the first to go. Replace that with something lighter and more breathable like crisp linen bedding. Not only will it feel lighter and cooler on skin but linen is naturally moisture wicking so you’ll always feel snug and dry, never soaked. You can use this all spring and right through summer. Just change the decor up with some shams once in a while when you want to shake things up. 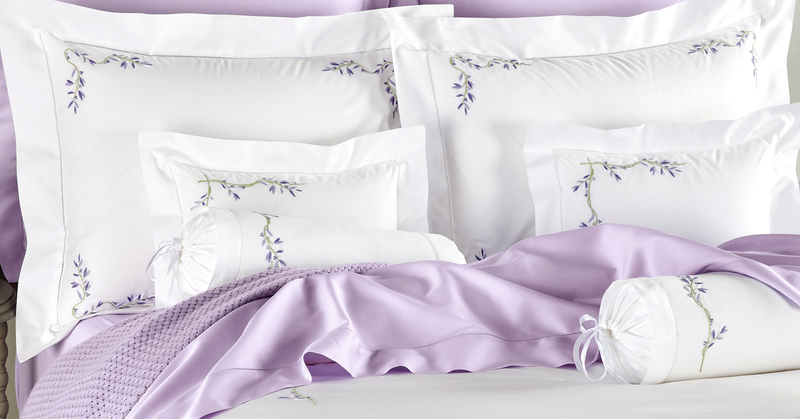 Other great springtime fabrics to consider for your sheets are soft Egyptian cotton in percale or sateen. Schweitzer offers these in any thread count you please and like everything created by them, they are made with the utmost precision and care to serve you well and deliver the best night’s sleep for many years to come. With so many incredible sets and styles to explore and delight in, it’s hard to pick just one–so don’t. Schweitzer Linen is one of the only brands to offer products of such superior quality at such an affordable price, so you can grab a few sets and change it up whenever you’re in the mood. Contemporary,” “modern,” and “amazingly beautiful” all are easy descriptions for the naturally breathable comfort of our 100% easy-care linen–designed to help you slow the world down and catch your breath. Imported. Straight from the finest Italian artisans to your bedroom, the pure and heavenly 600 thread count Egyptian cotton percale creates a crisp and clean spatial ambience that will leave your environment renewed and your mind feeling refreshed and uncluttered. Imported. Printed on pure 300-count Egyptian cotton sateen, the preciousness of life’s natural joy is on full display with this heartfelt design that celebrates the stages of growth—from budding beauty to full-bloom gorgeous. Made in Italy. During the winter and colder months of fall, a comforter is the perfect place to hide from the cold and savor the toasty joys of its warm embrace. But anyone who has tried to hold on to that feeling in spring is likely to tell you a different story. It usually ends up being cast on the floor in late night desperation to cool down. 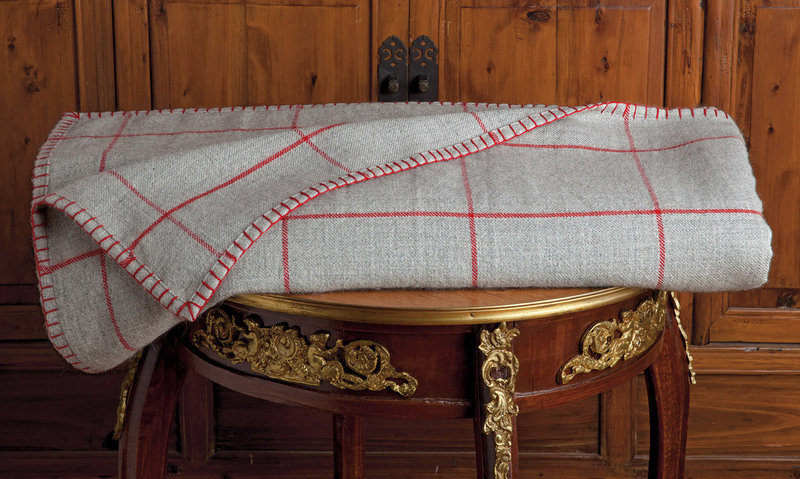 This is why it’s the perfect time to discover Schweitzer’s amazing assortment of blankets, quilts and throws. These springtime essentials are available in all sorts of fabrics and ready to take your room to the next level with charming designs and mood-lifting tones. From the renowned silky soft feel of cashmere to the legendary touch of naturally supple alpaca wool, these everyday pleasures will have you forgetting about your comforter after one night. Plus, there are so many different ways to experience these comforts. 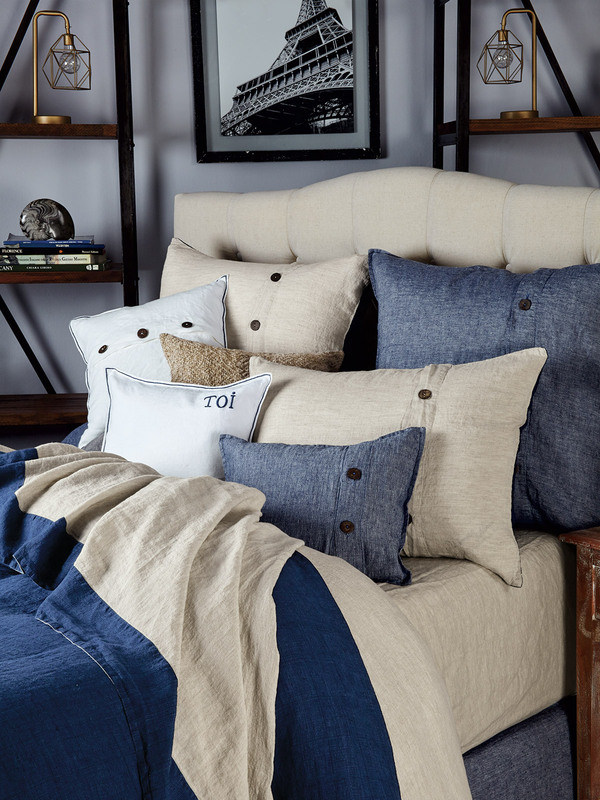 Find your favorite look, color theme or pattern from Schweitzer Linen’s huge selection of exclusive styles–or mix and match to create the comfort level and color combination of your dreams. Whatever you decide on, you can be sure it is made using the same exceptional standards every Schweitzer product is made with–including an unwavering attention to detail rivaled by none. If you could run your hand over this velvety smooth blanket of 100% pure baby alpaca, you would want your entire body to luxuriate in the incomparable feel of it. Made in Peru. 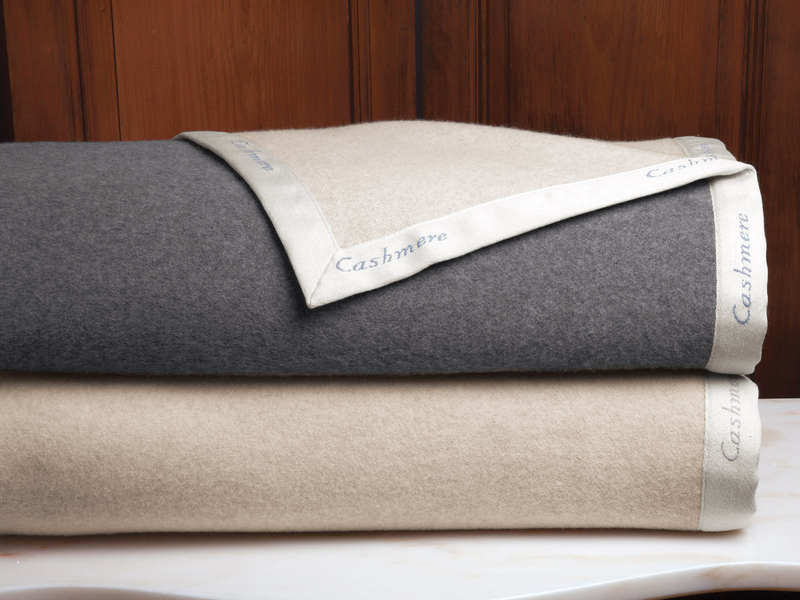 Radiating warmth and softness, 100% pure Cashmere blankets indulge every craving for coziness. Now reversible in beautiful, neutral colors. Made in Italy. Bringing a new dimension to luxurious living, super posh shams and reversible quilts are highlighted by hand-quilted squares of lush silk velvet, backed by luscious pure silk. Imported. There’s a reason why certain colors are used during certain seasons. It’s not just the whimsy of the fashion runways. It’s scientifically proven that some colors affect the mood in certain ways. In fact, studies show that if we surround ourselves with the right colors, patterns and environment, we are far more likely to be happier, more confident and more optimistic people. Who doesn’t want that? Start planning the color revolution in your room and you could soon see the type of transformation that improves your sleep, you bedroom experiences and every other aspect of your life. There is no right or wrong answer. The only thing that matters is how it makes you feel and how you want to feel. Select the colors and patterns from Schweitzer Linen’s giant assortment of styles and once you implement it into your daily life, you’ll see the difference immediately. 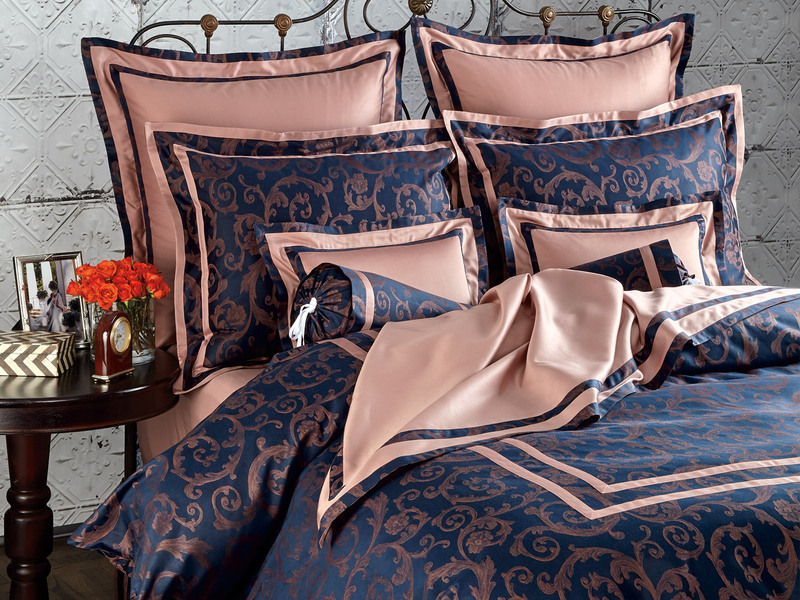 Perfect paisley patterns swirl on shimmering Navy Italian damask in 500 thread count Egyptian cotton like pools of sun-kissed reflections you’ll want to bask in all night — and maybe all day. Made in Italy. Like a perfect breeze floating up through seaside windows from the coast, the airy texture of this 100% easy care linen import takes you to a place of infinite pleasure, peace and contentment. Imported. Upon one of our visits to the famed Louvre museum, a delicate fresco made an impression on us. 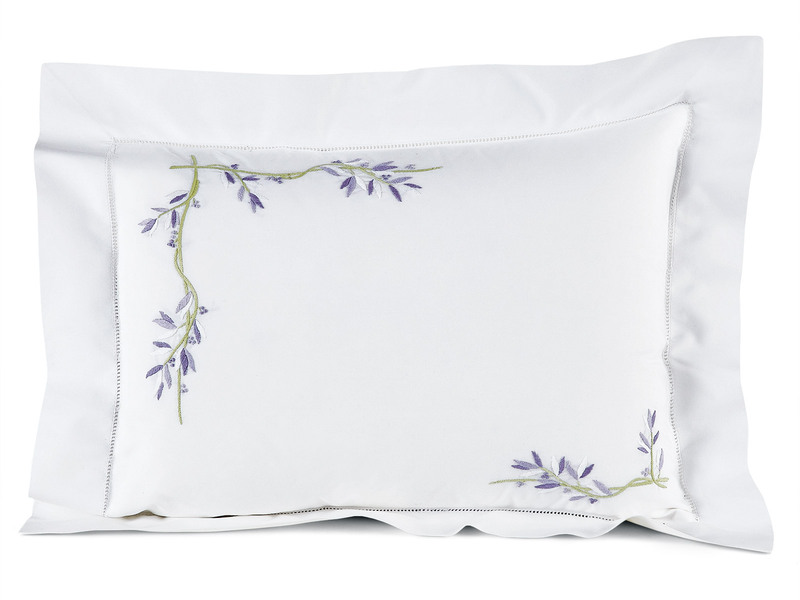 A dainty leaf design, 600 thread count Italian percale, and true hand embroidery, with hand hemstitching, are timeless essentials and create enchantment. Imported. 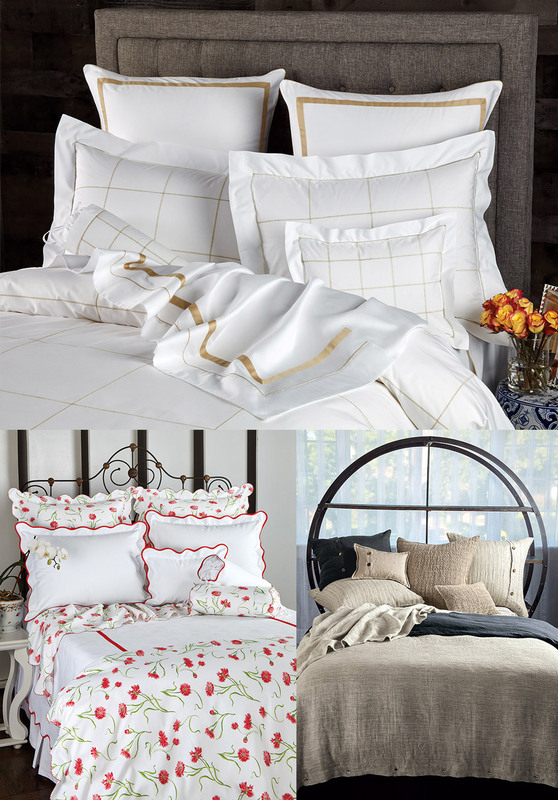 They say spring is all about rebirth so give your bedroom new life and the kind of comfort and decor you deserve with lighter fabrics, gorgeous colors and inspiring designs from Schweitzer Linen.